The Alps contain some of Switzerland's most dramatic landscapes, in a country already well endowed with spectacular scenery and fabulous alpine vistas. Situated at the heart of the Alps, Switzerland shares the mountain range with France, Italy and Austria and provides winter and summer time enjoyment for skiers, snowboarders, walkers and climbers. Switzerland boasts the first ever ski resort, and since then over 200 first class resorts have attracted thousands of Swiss and international downhill and cross-country skiers as well as snowboarders. The tradition of skiing goes back two centuries. Today, with more than 1,700 mountain railways and ski lifts, renowned ski schools and instructors, the best ski equipment in the world, and outstanding slopes and facilities catering for all levels of ability, it deserves to be called 'Europe's winter playground'. The ideal resort for beginners or families is Grindelwald in the Jungfrau region, while intermediates and snowboarders head for the twin resorts of Davos and Klosters, with miles of excellent ski terrain and acclaimed to be one of the top snowboarding destinations worldwide. 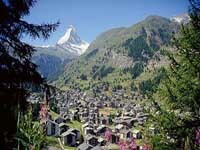 Expert skiers can enjoy the challenge of 7,200 ft (2,700m) vertical drops on the Klein Matterhorn at Zermatt, and the ski valley of Verbier is ideal for shoulder-season skiing as its location provides early snow that lingers late into the spring. The stylish resort of St Moritz offers the most energetic and varied nightlife out of all the Swiss resorts. The ideal ski season runs from January to late March, but is most crowded during the Christmas holidays and the month of February. Climbers and walkers head to the Alps between June and September when the weather is warmer and more settled. There are more than 40,390 miles (65,000km) of well-marked and maintained hiking trails as well as longer treks across the country that will reveal miles and miles of unspoiled beauty. Grindelwald has long been the capital of summer hiking in the Bernese Alps, and more recently added a network of groomed trails for winter hikers. Climbers have long been lured by the challenges of the Matterhorn and there are some memorable hikes up to the cliffs below the summit. The Swiss Alpine Club (SAC) is the best source of information on mountaineering. The most accessible and visited alpine area is the magnificent Bernese Oberland region in the centre of the country with classic Swiss scenery - picturesque peaks, quaint wooden chalets and charming mountain villages, green pastures, lakes and the tinkle of cow bells. This is a fabulous area for walking and provides exceptional winter sports.